The explosion of unstructured information in enterprises and the lack of effective data management is not only a source of concern for business leaders but also a security and compliance risk. Moreover, the advent of cloud-based storage solutions has added yet another dimension of complexity. Forward-thinking business and technology leaders view Enterprise Information Management (EIM) as an opportunity and not a burden. An opportunity to improve productivity, increase process automation, reduces costs, and improves compliance. A corporate EIM strategy needs to be practical, yet comprehensive. It needs to be tied to business activities that assess areas where EIM can make a positive impact— increase revenue, decrease costs, and mitigate risk. EIM service providers focus on a results-driven strategy, building long-term plans that align with operational strategies. Some of the EIM program implementation focus areas include day-to-day program management and execution, EIM framework development and deployment, platform implementation, and change management. Even for organizations that have identified the need to manage information as an enterprise asset, determining what it really means and how to get started can be difficult. The management of information is an enterprise effort, and cannot be left to each department or business unit without impacting the overall effectiveness and business value EIM can provide. The key to an effective EIM program includes business participation, business impact, technologies, and education. Organizations need to take an active and planned approach to managing their information to obtain maximum business value to succeed in today’s technology environment. An EIM initiative provides the framework and roadmap for an organization to achieve real information knowledge and true business impact. To support EIM, organizations require a full suite of reliable and scalable services that can help secure data, make information and applications more available and accessible, and simplify the management of information assets. 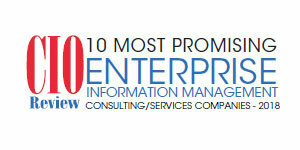 The current edition of CIOReview brings to you “10 Most Promising Enterprise Information Management Consulting/Services Companies – 2018.” The list highlights some of the most prominent organizations of the industry that offer innovative tools and services in the EIM landscape.